There's a saying that states you can't see Rome in a day. Well, it's true. Very true. Today was adventure day since I opted to not take one of Norwegian's shore excursions. I had done a lot of research and the overwhelming consensus was that it was much better to do it in your own, so that's what I did. After an early breakfast, Dwight and I disembarked and boarded a shuttle bus to the port exit. Like most ports of call, the area is heavily industrialized and passengers are not allowed to walk out of the port. Following the steps I had seen on YouTube, we walked to the train station and only had to wait a few minutes for the 8:41 train. Arriving at Termini station in downtown Rome around 9:45, we got Roma Passes which provided admission to any two sites/museums as well as free use of public transportation. Two stops on the Metro later we were standing outside the Coliseum. We walked around the perimeter and took pictures before working our way into the sea of fellow tourists. As we were trying to determine which line was which a young lady approached us and asked if we were interested in a tour. We chatted a bit and it turned out that she was from Philadelphia and had at one time applied to York College, less than 10 miles from me. Small world syndrome strikes again. 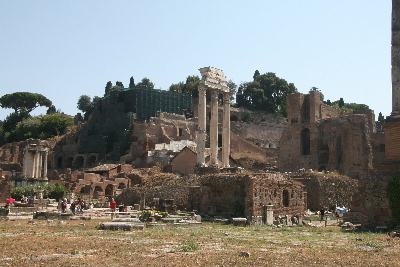 The tour included professional guides of not only the Coliseum but also Palatine Hill and the Roman Forum. The price was very reasonable since our Roma Passes already covered the entrance fees so we agreed and followed her to the tour meeting point. Our guide for the Coliseum tour was an Italian gentleman named Roberto who was not only very knowledgeable but very entertaining as well. He gave us a brief history of the arena and some background on the political environment that led to its construction and destruction. We then went inside and up the stairs to the main level. In addition to the important facts, Roberto gave us many interesting and sometimes humorous bits of trivia. He often quizzed tour members on things that should have had an easy answer and one young lady from Canada kept giving the wrong ones. At one point he jokingly admonished her to stop answering! The Coliseum is truly spectacular; words really can't describe it. It is both awe inspiring and a little humbling to imagine how something that amazing could have been built with the technology of the times. To stand on the very stones that both Emperors and common Romans stood on almost 2,000 year ago really brings history to life. The brutality of what happened there also makes one appreciate not only how far we have come but how far we have yet to go. After Roberto's excellent tour we waited a short time for our second tour guide. Elaine was a lovely young lady from Toronto and she gave a very thorough synopsis of the birth and death of the Roman empire and the role that Palatine Hill played. This place is to Rome what Independence Hall is to Philadelphia and America. While the story is vastly different, the history is equally important to Rome and Italy. 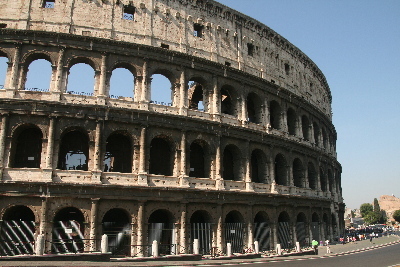 Unlike the Coliseum, much of this area had to be excavated because it had been buried by centuries of mud from floods caused by infrastructure deterioration after the Romans left. Quite a bit is still being uncovered even today and it was fascinating to see some of that work in progress. By now it was after 2:00 and we wanted to squeeze in the Sistine Chapel before we had to catch our 16:40 train back to Civitavecchia and the ship. The Vatican is on the opposite side of town and, while we could have used our passes to get there on public transportation, we opted to hail a cab. Thus far we had only experienced the infamous Italian drivers from the perspective of a pedestrian. That's scary enough, but being inside a cab being driven by one of those maniacs was a whole new experience. While the streets of Rome do (in some cases) have lines painted for lanes, they appear to be non-functional and purely decorative. First we pulled a U-turn in the middle of one of Rome's busiest streets then we hightailed it through multiple traffic circles, crossed to the wrong lane around other vehicles that weren't moving fast enough, ran more than one red light, scared the bejeezuz out of several pedestrians and cursed out a few scooter drivers who, by the way, are even worse drivers. After that hair-raising ride we were safely delivered right to the entrance of the Vatican museums. Keeping an eye on the time, since we had to allow for a 15 minute walk to the train station, we breezed through security and got our tickets. We tried to use the remaining freebie on our Roma passes but, as the saying goes, we weren't in Rome anymore. The Vatican is actually a separate sovereign state and our Roma passes were no good here. Once we were up the long escalator to the main level we could see the Sistine Chapel. Unfortunately we didn't see any obvious way to get there until I spotted a sign labeled “Capella Sistina.” We kept following those signs through many, many glorious halls of paintings, frescoes and sculptures. I really wish we had had more time to stop and appreciate them. The Vatican museums have, believe it or not, 7 miles of corridors and it seemed like we were trapped in an endless maze. Finally we made it through the sea of people and, even though we couldn't stay too long, the chapel and its ceiling were magnificent and well worth the trials and tribulations. We exited directly into St. Peter's square, a sight familiar to anyone who watches television on Easter or Christmas. There was a trailer setup in the square as a mobile Post Office and I made a quick purchase of some commemorative Vatican stamps for some friends. Despite our best efforts we proved that you, indeed, can't do Rome in a day but I think we did pretty well. The walk to the train station was about 15 minutes and we were actually arrived 10 minutes early; we both hit the vending machines for some liquid refreshment. Our train arrived right on time and since it was an inter-city express train it was configured differently than a normal coach train. 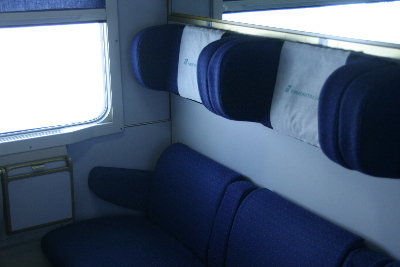 Just like the European trains you see in the movies, it was divided into individual seating compartments with a sliding door for privacy. We were traveling in style on the final leg of our journey back to the ship. The trip was 20 minutes shorter than the one into Rome because we made no stops and the Norwegian shuttle buses got us back to the ship in plenty of time for a little R&R before the big event later. Everything else so far was merely icing, the cake itself was being served tonight: Alex's solo show. It was the main reason that I was 5,000 miles from home and was something that I had been dreaming about ever since my heart went home again in Roanoke. The setting was an informal one, sort of cabaret-style, with a very small stage occupied by the band and a large open area between the stage and the tables where the audience was seated. Oddly, the front row was not completely occupied, with the other Showtime at Sea performers preferring to sit in the back. The band was the same as for the Monday night show, two keyboardists, Una on violin and Brendon on an assortment of instruments. After what seemed like an eternity, Peter appeared and gave a short introduction. Alex then came out from behind the curtain in the same stunning burgundy gown she had worn in Sweden. With no fanfare she started with a few bars of ABBA's I Had a Dream and then transitioned into Don't Rain on My Parade, holding that last note like I've never heard her do before. Clearly this was a different Alex than I had seen either with CW or in Sweden. And I was loving it. She then chatted with the audience for little while telling us some stories and explaining that the theme for the show was “I dreamed a dream.” As she introduced the next song, Dreamers from the little known musical Jean Seberg, she joked that this would be the only 'berg we would encounter on this cruise. She followed that with what she called a Judy Garland medley with a twist at the end. It was an eclectic mix of Over the Rainbow, Clang, Clang Went the Trolley and Defying Gravity from Wicked. Two more medleys closed out her show. The first was a Doris Day selection including Secret Love and Que Sera, Sera and the finale was a long Disney collection that started and ended with When You Wish Upon a Star and included selections from Pocahontas, Aladdin, Tangled and few others that I didn't recognize. The show was over far too soon. Unlike the concert in Sweden, this was much more laid back and personal, very similar to one of Órla's concerts. After Peter's solo show I had a chance to chat with Alex. I told her that the entire cruise was worth it just for that hour with her. She was flattered and said that she appreciated that I had come so far. Her mom was with her and Alex introduced us. 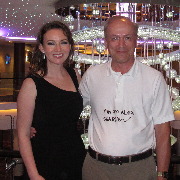 Her mom is very nice and, although we didn't have a lot of time to chat tonight, we spoke at length Thursday evening. Alex graciously posed for some pictures but my camera was misbehaving and they didn't come out very well. We did a retake on Saturday so all's well that ends well. It had been another long day so it was time to hit the sack. Florence and Pisa tomorrow with lots of walking and a tower climb. A realistic statue outside the port of Civitavecchia. 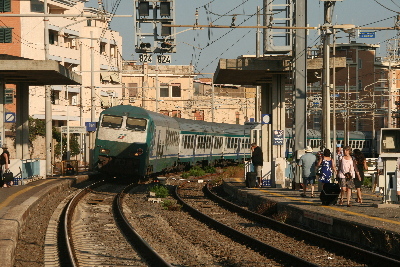 The 8:41 train to Rome. 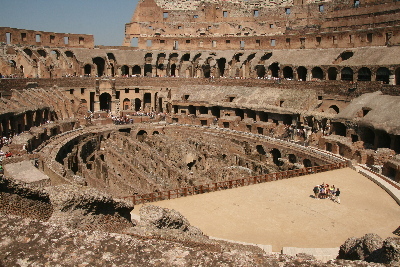 The Coliseum, outside and inside. 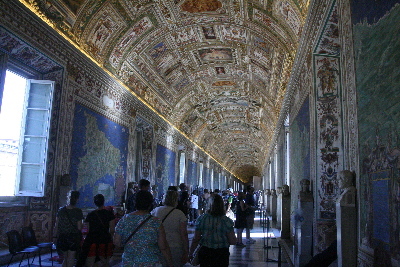 Just one of the many spectacular corridors in the Vatican museums. 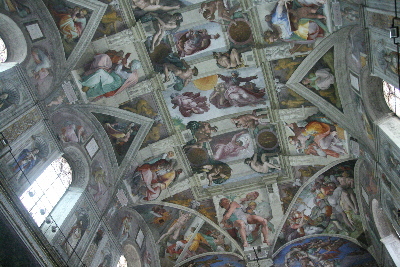 The famous ceiling of the Sistine chapel. Our private compartment for the trip back to the ship.